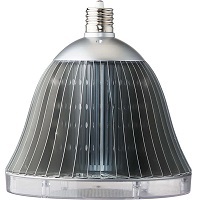 Lighting Efficient Design made this item to be part of their LED High Bay series. LED dimming controller is required for dimming, The silence operation will allow less disturbance in your environment. The external drivers can be mounted 250 feet away. The light output will be 19,344 lumens from only 150 watts. Also this product's base is an EX39. It is DLC approved and comes with a 5 year warranty.